Robots can change directions, speeds and even their colors. But what about changing their shapes? With help from a sculptor's intuition, Yale researchers are on it. "We're trying to create robots that can adapt their morphology and behaviors on demand," said Kramer-Bottiglio. "We've found that changing both the body shape and the way it moves helps the robot to overcome obstacles or continue task performance despite changing terrains and environments." The cylinder-to-dumbbell device is the first of the shape-changing robots that are the focus of a $2 million, four-year grant that Kramer-Bottiglio received from the National Science Foundation (NSF), as part of the NSF's Emerging Frontiers in Research and Innovation (EFRI) program. The core of the robot is made of a clay-like substance. The core is wrapped with two "robotic skins" developed in Kramer-Bottiglio's lab, made from elastic sheets embedded with custom-made sensors and actuators. One of the skins provides the robot with a rolling locomotive force. The other manipulates the material into different forms - much like a human would to sculpt clay. "Starting with a block of clay and then applying surface forces, a sculptor can mold clay into any desired shape," she said. "We're taking a similar approach - using robotic skins wrapped around the clay and applying those same techniques to reshape the core." To get a handle on what exactly those techniques are, the Kramer-Bottiglio lab is working with sculptor Susan Clinard to understand the best way to transform clay into different shapes. That is, how can a block most efficiently change into the shape of, say, a four-legged creature? To capture the transformation and all the intermediate shapes, they filmed Clinard from numerous angles as she repeatedly performed the same molding task. To emulate the mechanics of their robots, the researchers instructed her to use only one hand and not to add or remove any material. And to better ensure that Clinard relied on her instincts as a sculptor, the researchers purposely gave her as little information as possible about the study. The project also draws inspiration from organisms that alter their body structures to adapt to changes in their environments or conditions. For instance, amphibians can grow new limbs after an amputation, and tadpoles and caterpillars completely reconfigure their bodies to take on a new set of capabilities. It took the researchers some trial and error to find the right material for the robots' core. "Humans can sculpt relatively viscous and stiff clays by using the mass of their body and contact with the ground to generate a lot of force to push inward," said Dylan Shah, a Ph.D. student and first author of the study. "But a robotic skin can only rely on itself to push inward." 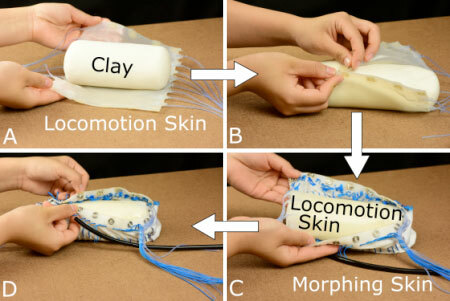 Although they informally refer to it as "clay," the researchers chose to use Model Magic, a modeling compound that's stiff enough to hold its shape but still soft enough to be manipulated by the robots' actuators. Considering the countless possibilities for shape transformations and their potential uses, Kramer-Bottiglio noted that many more morphing robots are on their way. Up next is a spherical robot that flattens like a pancake and then uses an inchworm gait to make its way up a steep incline.